This rare document was issued in Washington, D.C. to the vessel Light Horse out of New York, which was under the command of John Hass with a crew of 14 men. The vessel carried no guns. This very rare Mediterranean passport has to be one of the earliest issued since it was only in June of 1796 that Congress passed a law requiring the Secretary of State to prepare a form for Mediterranean passports and submit that proposed form to the President for approval. The English “Mediterranean Pass” was used as the model for what became the distinctive American Mediterranean passport. It is not kown how long it took for this design to be developed and the Presidential approval process to be completed, but since this was signed and issued within six months of the law’s passage, it has to be among the very earliest issued. The necessity for these passports emerged from the capture and plundering of American vessels by pirates along the Barbary Coast of North Africa. Prior to the American Revolution, American vessels were protected by British Treaties, but with independence the young United States had to negotiate their own treaties and, like other nations, pay tribute for protection from attack. In 1795 the United States concluded a treaty with Algiers and it was then necessary to develop an official document to identify American vessels to the Algerians and later to other countries along the Barbary Coast. This Mediterranean passport has the distinctive scalloped cut across the top since the top portions of the passports were shipped to U.S. Consuls in the Barbary states to be used in matching and authenticating the passports held by the ships. 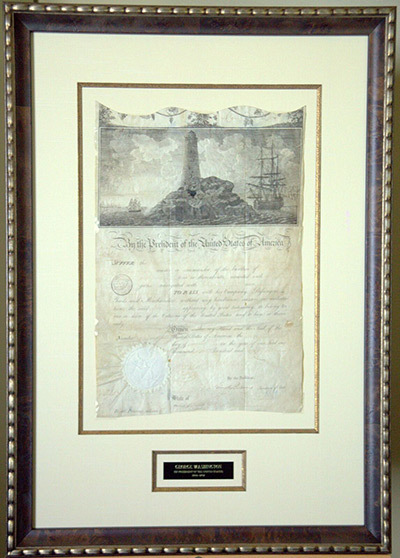 The treaty with Algiers in 1795 caused Congress to ask for the passport to be designed in 1796 and this particular document, issued late that year, is among the very first issued. It was issued by President George Washington less than three months before he left office, and since the Mediterranean passports had just come into use, Washington signed only a few before leaving office. Therefore, Washington’s Mediterranean passports are extremely rare. It is signed by President Washington who served as the nation’s first President for two terms, from April 30, 1789 until March 4, 1797. This document is also signed by Timothy Pickering, who signed this document as Secretary of State. A scandal, much of which was fomented by the ambitious Pickering, had embroiled the earlier Secretary of State Edmund Randolph who resigned on August 20, 1795, the day on which Pickering, who had been Secretary of War, was appointed as ad interim Secretary of State. Pickering had his full appointment on December 10, 1795 and signed this document in that capacity. The ship’s name, Light Horse, is unusual so it is likely this is the “snow Light Horse” that was built in 1796 in Maryland, which would explain why she was issued her passport in Washington rather than New York, her nominal homeport. A snow is a type of brig, a two-masted, square-rigged sailing vessel. She was involved in an international incident in 1798 that was not resolved until May 27, 1914, 116 years after the event. In 1798, the Light Horse under the command of James Gibson and sailing out of Baltimore bound for Amsterdam, was seized by the French privateer L ‘Acteon and her cargo and stores were plundered by the French. Less than a month later, the British naval ship Anson captured the Light Horse from the French. Insurance companies paid the owners for their losses, and in 1914, the insurance companies sought recompense through the Court of Claims under the French Spoilation Act of January 20, 1885. The Court awarded the claimants $12,000.47. Reference: 63 rd Congress, 2nd Session, House of Representatives, Document No. 1010. This document is printed on parchment and as is typical of Mediterranean passports, the top is scalloped from where the top portion was cut off. The Great Seal of the United States is embossed on the lower left.